Not only is the Charles Page High School boys’ soccer team headed to the playoffs for the first time in recent memory, they also get to host their first round game after finishing as the District 6A-4 Runners-Up. The Sandites (12-2) concluded the regular season last week with a 4-2 road win against Capitol Hill, putting them at a 5-2 district record. Also 5-2 is Owasso, who the Sandites defeated 5-4 last Tuesday for the tie-breaker win. Securing the district crown was the defending State Champions from Union (10-2, 7-0). Sand Springs will host Enid (9-6) Tuesday, April 30th, at 7:00 p.m. The quarterfinals will be held Friday, May 3rd on the home field of the winner of Jenks vs. Norman. Semifinals are set for Tuesday, May 7th. The Championship round will be played either May 10th or 11th. Sand Springs is having a historic season, winning their first nine matches and the Edison Green and White Tournament. They are 6-2 against 6A opponents, have won their last two matches, own four shutouts, and win by an average score of 3-1. Enid is 7-4 against 6A foes and is coming off a win with an average score of 2-1. Neither team qualified for last year’s playoffs. The Sandites previously beat the Plainsmen 2-1 in a non-district overtime shootout. Gustavo Saldana made a regulation penalty kick to tie the match and send it to overtime. Then Kaiden Cox, David Fancher, Fernando Saldana, and Gustavo Saldana all made PKs to win the shootout 4-3. Ethan Tippit got the win in the net with three saves. Fernando Saldana, a sophomore, has been the bread and butter for the Sandite offense this season with fourteen goals. No Sandite but Saldana has scored a hat trick, and Saldana has two. He also has two braces and a four-point performance against Shawnee. Sand Springs isn’t a one-hit wonder, however. Twelve players have scored and eleven have goals. Senior Gustavo Saldana and sophomore Jack Bratcher both have braces and are tied for second on the team in total scoring. Southmoore (7-7) at U.S. Grant (12-2). Grant went 6-1 for the District 1 title, with their only 6A loss coming 5-1 to Deer Creek. They win by an average score of 3-1, have recorded six shutouts and one mercy rule victory, and have won their last five matches. They are ranked 23rd in the nation by MaxPreps with wins over Putnam City, Westmoore, and Edmond North. Grant was eliminated in the first round of last year’s playoffs. Southmoore is 4-7 against 6A opponents and is riding a three-match losing streak. They win by an average score of 3-2, have five shutouts this season with one mercy rule win. Southmoore did not qualify for the post season last year. Deer Creek (10-3-1) at Mustang (12-3). Mustang is ranked 23rd in the country by USA Today, and holds an 8-3 record against 6A opponents. They win by an average score of 4-1, have seven shutouts, one mercy-rule win, and are coming off a loss in the de facto district title game. They have wins over Southmoore and Putnam City. Deer Creek is 8-3-1 against 6A opponents with three shutouts, and is on a three-game win streak. They win by an average score of 3-2 and have victories over Southmoore, U.S. Grant, and Edmond North. The Broncos previously defeated Deer Creek 3-1 in the second game of the season. Last year Deer Creek upset Mustang 5-1 in the first round of the playoffs. Bixby (8-7) at Union (10-2). Union went undefeated in District 4 and their only in-state loss was 2-1 to Jenks in the season opener. They win by an average score of 3-1, have six shutouts, and are on a four-match win streak. The defending State Champions are ranked 14th in the nation by MaxPreps and have wins over Broken Arrow, Norman North, Norman, Owasso, and Sand Springs. Bixby is 5-5 in 6A action, with an average score of 3-1. They’ve won five shutouts and are on a three-game win streak. Bixby did not qualify for last year’s playoffs. Owasso (9-6) at Broken Arrow (9-3). Broken Arrow is 7-2 against 6A opponents with their only losses coming to Union and Jenks. They’ve won four shutouts, beat Enid and Bixby, and are on a five-match win streak with an average score of 3-1. Owasso is 6-5 against 6A foes and is coming off a win. They own five shutouts this season, winning by an average score of 3-1, and have victories against Bixby and Norman. Broken Arrow previously beat the Rams 2-0 in their third match of the season, and beat them 4-0 in last season’s first round playoff. Norman (10-3-1) at Jenks (15-0-1). The Trojans are one of only two undefeated teams left in the state, ranked 3rd in the nation by USA Today and 9th by Max Preps. They have a division-best nine shutouts and two mercy-rule wins, an average score of 4-0, with wins over Union, Broken Arrow, Bixby, and Enid. They are the returning State Runners-Up. Norman is 9-3-1 against 6A opponents with six shutouts and wins over Southmoore, Norman North, Westmoore, and Sand Springs. They win by an average score of 3-1 are returning State qualifiers. Enid (9-6) at Sand Springs (12-2). Edmond North (9-5) at Norman North (10-5). Edmond North is 8-4 against 6A opponents and has several impressive showings in their resume. They have wins over Mustang and Westmoore and only lost by a single goal to both Grant and Deer Creek. They have five shutouts, are coming off a victory, and win by an average score of 3-2. Norman North is 9-3 against 6A foes, riding a three-match win streak with a 3-2 win over Mustang to clinch the District 2 title. They win by an average score of 3-2 and own four shutouts, with wins over Westmoore, Putnam, and Southmoore. Both teams are returning State Semifinalists, and Norman North beat the Huskies 3-2 in the third match of the season. Putnam City (9-5) at Westmoore (9-6). Putnam is 7-4 against 6A opponents and coming off a win over Southmoore. They have six shutouts and one mercy-rule win, beating their foes by an average score of 3-1. Westmoore is 9-5 against 6A opponents and have won their past two matches. They have four shutouts, lead the division with four overtime wins, and have beaten Mustang, Southmoore, Deer Creek, and Owasso. Charles Page High School junior Jaxon Skaggs (3-1) had a breakout performance Monday evening, throwing fourteen strikeouts, two hits, three walks, and no runs in five innings on the mound. 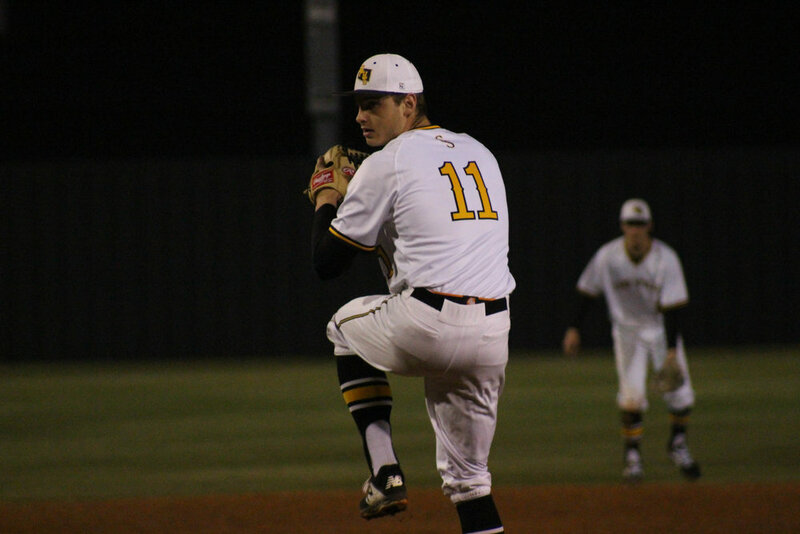 The Sandites (20-7, 8-2) won 5-1 Monday and 2-0 Tuesday against Southmoore High School (4-27, 2-10) to move into the second-place position in district standings. Northern Oklahoma College-commit Cale Savage went two-for-three at the plate Monday, scoring two runs and four RBI with a double and a home run. The dinger was only the second of the season for Sand Springs, and the second of Savage’s career, and it put the home team up 1-0 in the top of the fourth. Kiefer Massey hit an RBI single in the sixth to score Savage. The Sabercats also got on the board that inning with an RBI double from Jared Clark to score Parker Powell. Savage cleared a loaded diamond with a 3RBI double in the top of the seventh. Preston Berg (0-1) pitched two innings of relief, throwing three hits, three strikeouts, and one walk to earn his first save of the season. Undefeated senior Seth Villines (4-0, 5-0) went the distance Tuesday, tossing two hits, four walks, and four strikeouts in the seven-inning shutout. Sand Springs scored both of their runs in the fourth inning Tuesday. Brycen Peterman came in on a single from Jacob Snodgrass and Cal Watkins stole home. The game was the fifth shutout of the season for Sand Springs. The win pushed them to their second-consecutive twenty-win season and best district record since 2015. Sandite baseball will return to action Thursday at 6:00 p.m. when they host Enid (22-9, 6-4). They will then travel to Enid Friday. The Sandites can clinch the District Title by winning their final two games. The Charles Page High School varsity baseball team (18-7) split a pair of non-district tune-up games this past weekend, winning 5-3 against Union (10-18), but falling 8-4 to their rivals from Sapulpa (17-15). On Friday they gave up a 3-0 lead to the Redskins, but shut out their guests in the remaining six innings. Kiefer Massey (1-0) got his first win of the season, throwing one hit, two strikeouts, and one walk in two innings. Seth Villines (4-0, 5-0) got the start on the mound with three hits and three walks in three innings. All three hits came in the top of the first. Malachi Burks got the home team on the board, scoring on a sacrifice fly from Cal Watkins in the bottom of the first inning. Jacob Snodgrass and Michael Miller scored on an error in the second to tie it at 3-3. Burks sacrificed to bring in Ryan Seabolt in the fourth and Brycen Peterman hit a double to score John Miller in the final run of the game. John (2-1, 7-2) and Michael Miller pitched one inning each in relief. Michael Miller threw two strikeouts and a walk, while John Miller threw three strikeouts and was credited with his second save of the season. On Saturday the Sandites headed south on Highway 97 to take on their biggest rivals. Cale Savage batted in Burks with an RBI single in the top of the first. Back-to-back doubles from Evan Casey and Alan Shibley tied it up in the bottom of the third, but back-to-back doubles from Watkins and Kyler Copeland put the visitors back out front at 3-1 in the fourth. Ben Banker (6-0, 7-0) got the start on the mound, throwing six hits, three walks, and one strikeout in three innings, but Sebastian Cassidy (3-3) was stuck with the loss. Cassidy threw three hits, one strikeout, and three walks in two innings. Things began to fall apart in the bottom of the fourth. Alex Wright singled, advanced on a pair of errors, and scored on a passed ball. Cassidy took over with two runners on base and the Chieftains took a 5-3 lead before the inning came to a close. Villines scored the Sandites’ final run on a sacrifice fly from Savage in the fifth. Sapulpa doubled down in the sixth, loading the bases with two singles and a walk. Watkins (1-0) took over pitching duties, but the Chieftains scored one on a sacrifice and two on an error before a strikeout concluded the inning. The Charles Page High School boys’ soccer team (12-2, 5-2) ended the regular season with back-to-back district wins, topping Owasso (8-6, 4-2) in overtime Tuesday, and beating Capitol Hill (5-8, 2-4) Thursday to spoil the Red Wolves’ senior night. On Tuesday Jack Bratcher recorded his first brace of the season, Cameron Summerton notched his first goal of the season, and Gustavo Saldana also made his way onto the board for a 4-4 tie in regulation. Fernando Saldana kicked the golden goal in the 87th minute of the match in sudden victory overtime. The final district game started an hour late following a transportation issue and a lightning delay. At one point the boys were in the middle of loading up to leave when they finally got the go-ahead to start the night. They made the most of it, taking a 4-0 lead on the home team before the Red Wolves battled back, and some of the battles were quite physical. Sand Springs got off ten shots in the first half and took a 3-0 lead. Luke Jeffus was first on the board, scoring on a corner kick from Bratcher in the 5th minute. Bratcher took a pair of shots of his own, scoring a header in the 12th minute to put back a shot from Gustavo Saldana that bounced off the goalpost. Salvador Castellon took a free kick for the home team from ten yards out in the 20th minute. He kept it low on the ground and got it past everyone, but just a few inches wide of the goal. The Wolves made another run on goal a few minutes later but Kaiden Cox cleared the box for the Sandites and a pair of corresponding corner kicks sailed wide. Senior Goalkeeper Jose Alvarez made a beautiful save on a shot from Bratcher in the 31st minute, then Miguel Lopez barely evacuated a shot from Gustavo Franco that got past Alvarez and into the goal but didn’t quite make it to the net. The resulting corner kick set up Jeffus for his first brace of the season in the 34th minute. Gustavo Saldana bounced one off the goal post early in the second half, then Jeffus had a shot saved a few minutes later. Jeffus recorded his first hat trick from 25 yards out in the 45th. Alvarez blocked one shot, then Dawson Quinton nearly scored a putback but sent it a hair wide. A full on brawl erupted in the 49th minute after a Sandite went down and a Red Wolf appeared to trample him. Both teams combined in a massive shoving match, but thankfully no punches were thrown and only Lopez received a yellow card. Quinton and Alvarez received yellow cards in the 60th minute and Lopez took over in the goal. The Red Wolves finally began to battle back as Lopez saved shots from Kaleb Brooks and Gustavo Saldana and Jonathan Perez got them on the board in the 70th minute. Brooks received a technical with seven minutes left and Juan Vazquez made a 52-yard sailing free kick just over Xander Quirogas’s outstretched fingertips. Trent Goldman and Missael Hernandez were both carded after a brief shoving match with five minutes to play, but that was the last action of the night. Capitol Hill will return to action Tuesday in non-district action against Western Heights (8-3) while the Sandites will return in the State Playoffs on April 30th. The Charles Page High School girls soccer team (7-7, 2-5) traveled to Oklahoma City Thursday evening for their regular season finale and ended the year with a .500 record after a 1-0 overtime win against Capitol Hill (3-9, 0-7). The match almost didn’t happen. The Sandite teams arrived more than thirty minutes late after mechanical difficulty caused them to have to switch buses. They made it through the National Anthem and the team introductions, and were immediately sent back to the locker rooms after a lightning strike in the immediate vicinity. The girls were cleared to take the field despite another storm cell threatening in the distance. The teams agreed to play 35 minute halves instead of 40s and finally the first match began, 75 minutes late. Thankfully, the next round of weather never arrived. The game went through 70 minutes of regulation without a score, despite a lopsided offensive effort from the visitors. Capitol Hill didn’t get a single quality shot on goal, while the Sandites spent the majority of the game downfield. Sand Springs sent four shots a hair wide, had three saved, and bounced one off the goalpost. The first half was uneventful, with the only close shot coming two minutes in from Ari Esparza. The second half was a melee. Esparza and Elizabeth Horn both had shots saved, and the Red Wolf goalie won several foot races against Sandite forwards to scoop up threatening balls. After a scoreless second period they went to a ten-minute sudden victory overtime, and junior Demi Deshazo scored her second goal of the season to secure the victory in the 72nd minute of the match. The girls’ 7-7 record matched their tally from the prior year, but they improved from 1-6 to 2-5 in district action, and had far better performances in each game. Offensively they averaged 1.86 points per game, compared to 1.71 from the prior year. But defensively they only gave up 1.93 compared to 3.5 the year before. It was their first season under Head Coach Matthew Watkins. The Lady Sandites will be in good shape next season as they return 89% of their scoring power. They will only graduate four players in Amrey Lee, Alisha Carlisle, Brynlee Slankard, and Elizabeth Watts. The Charles Page High School varsity baseball team (17-6, 6-2) split a district home-and-home this week against Jenks (17-10, 8-2). They defeated the Trojans 5-1 Monday on the road, but fell 11-3 Tuesday on their home turf. The teams managed ten hits apiece on Monday. Both gave up a mess of walks and reaches-on-errors. Sand Springs stranded nine and the Trojans stranded eleven. Cal Watkins scored the opening run on an RBI double from Cale Savage in the top of the first. Kiefer Massey stole home in the second, then Jenks stranded loaded bases in the third and fourth innings. Malachi Burks and Brycen Peterman hit back-to-back RBI doubles in the sixth, scoring runs from Massey and Burks for a 4-0 lead before the home team averted the shutout. Jake Lamar reached on an error and scored on a single from Bryson Diener to get Jenks on the board, then Keaton Campbell scored the final run on a ground ball from Massey. Undefeated senior Ben Banker (6-0, 7-0) got the win on the mound, throwing nine hits, three strikeouts, and three walks in five innings. John Miller (2-1, 7-2) pitched relief and recorded his first save of the year, throwing one hit and one walk in two innings. Four Sandites saw pitching duty on Tuesday, and none managed to find their rhythm. The Trojans already lead 7-2 before recording their best inning in the seventh. They outhit the Sandites twelve to eight and benefited from four Sandite errors and seven walks. Oklahoma State University-commit Bryce Osmond scored the first run of the game on a double from Geo Blackshaw in the top of the first. Osmond had an exception night for Jenks. He went four-for-four at the plate with three runs and three RBI. He also got the win on the mound, throwing five hits, two walks, and nine strikeouts. Lamar scored on a sacrifice fly in the second inning, then Osmond hit an RBI single to bring in Eli Bilgrien. Osmond scored Jack Harding with a double in the fourth, then scored on a passed ball for a 5-1 lead. Bilgrien and Diener scored on an error in the fifth. Jenks loaded the bases and Bilgrien scored on another Osmond single in the seventh. Josh Cozzoni and Diener scored on a single from Blackshaw, then Osmond scored the final Trojan run on an error. Savage scored on a fielder’s choice in the second inning, Seth Villines batted in Jacob Snodgrass with a single in the fifth, and Ryan Seabolt hit a double to score Massey in the seventh. Sebastian Cassity (3-2) got the start and the loss on the mound, throwing three hits and three walks. Preston Berg (0-1) took over midway through the second, throwing four hits and a walk. Peterman (0-1) was sent to the mound in the fourth and threw one hit, two strikeouts, and a walk. Finally, Michael Miller pitched the final two innings and threw four hits, two strikeouts, and two walks. The District Title is still wide open, with Jenks, Broken Arrow, and Sand Springs all holding two losses. The Sandites will host Union (10-15) Friday at 7:00 p.m. and will travel to Sapulpa (16-14) Saturday at 6:30 p.m. in a break from district action. The Charles Page High School Track and Field teams brought home five gold medals from the Hornet Track Classic at Booker T. Washington Friday. The boys won four events and placed seventh as a team, while the girls had one champion and placed tenth. Mackenzie Rader won her first gold medal in the 100 meter hurdles, finishing in 17.59. Erika Baker placed sixth in the 3200 run in 13:27.08. Joel Mackey won his first gold medal of the season in the 100 dash in 10.91. He also won his third gold of the season in the 200 in 22.21. Aden Baughman won his fifth 800-meter race of the year in 1:56.75. Mitchell Medford won the discus throw for the second time this season with a distance of 147’07.00”, followed by Riley Magee in fourth place at 129’08.50”. Jaelyn Jackson placed third in the 400 in 52.62. Matt Wilkerson set a personal record in the 110 hurdles for the second-straight week, placing fifth in 17.88. The boys 4x100 relay team placed sixth in 45.40. Danny Murray set a new 3200 PR in 10:55.83. Davina Green and Joselyn Schinnerer set 200 PRs in 29.80 and 32.36, respectively. Dalton Wilcox set a 400 PR in 58.53. Both teams will return to action Friday at the Bravado Wireless Track Classic in Muskogee. The Charles Page High School varsity baseball team (16-5, 5-1) suffered a 3-2 walk-off loss to Bixby (20-5) in the third round of the Spartan-Tiger Turf War Friday night after leading for the entire game. Junior Kiefer Massey got his first varsity start on the mound, throwing two hits, two strikeouts, and eight walks in six innings. The Sandites led 2-1 when he was relieved by John Miller (2-1, 7-2). Miller took over in the bottom of the sixth and threw a strikeout to strand two runners, but things came unglued in the seventh. Luke Creeger tied the night with an RBI double and Trenton Dale scored the game-winning run on a single from Barrett Daniel. Both Sandite runs came in the top of the third. Cal Watkins hit an RBI single to bring in Seth Villines, and in turn scored on a single from Jacob Snodgrass. Bixby’s first run came in the fifth after Jaxson Crull singled, advanced on an error and a balk, and scored on a sacrifice fly. Crull and Blake Williams combined for eleven strikeouts, the most the Sandites have suffered all season. The Sandites were scheduled to play Sapulpa in the 5th/6th Place game on Saturday but it was canceled due to weather. They will travel to Jenks (16-9, 7-1) Monday at 6:00 p.m. in a return to district action. Three nights after snapping a four-game losing streak in an overtime shootout, the Charles Page High School girls’ soccer team (6-6, 1-4) snapped yet another streak, scoring their first goal in a month. 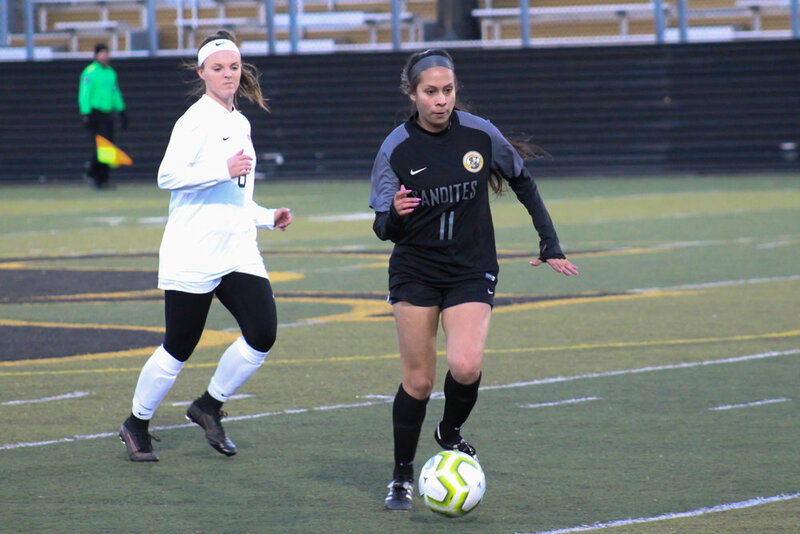 Though the Lady Sandites fell 2-1 in sudden victory overtime to Union (6-7, 2-3) and were eliminated from playoff contention, they got a moral victory when Ari Esparza ended a five-match scoring drought. The visitors were the aggressors for most of the night, outshooting the Sandites sixteen to four. But all those shots amounted to only two goals. Germari Harris had a close call in the 7th minute that barely caught the post and spat out. Sophomore goalie Ali Day recorded ten saves, and a few other shots were just a hair wide or high. Rachel Wheeler scored the lone regulation goal for Union in the 57th minute with an assist from Mackenzie Malham, but Esparza sent one just over the Redskin keeper’s fingertips to tie it in the 68th minute. Union loaded the Sandite box during a hectic 77th minute and took a pair of shots, but both bounced off Sandite defenders. Day saved a shot from Holli Meyer in the 78th and deflected a corner kick from Raquel Fanelli with just nine seconds left. Malham took one last shot as time expired that traveled a hair wide to the left. The Redskins came ready to rumble in overtime, however, and needed only eighteen seconds to score the golden goal on a double-assist that had Day trying to cover three directions at once. Sand Springs has only two matches left, both on the road. The girls will travel to Owasso (12-1, 5-0) Tuesday and Capitol Hill (3-6, 0-3) Thursday. The Charles Page High School varsity baseball team (16-4) dropped a 7-4 tournament battle to Jenks High School (15-9) Friday night in Bixby in the second round of the Spartan-Tiger Turf War, snapping a four-game win streak. The game was a preview of a district home-and-home the two will play next week. The Sandites went with a fairly inexperienced pitching crew and the Trojans made the most of it, outhitting Sand Springs 12 to 4, scoring in five of seven innings. Jaxon Skaggs (2-1) got the start on the mound and gave up two walks, two singles, and a balk for a pair of free runs. Preston Berg (0-1) took over and threw two strikeouts to pull out the inning. Sand Springs tied it up in the bottom of the second. Cale Savage hit a triple and scored on an error, then Kaegan Murray scored on a double from Ethan Sartin. They loaded the bases with a pair of walks, but left all three runners stranded. Two hits and an error put Jenks out front at 4-2 in the top of the third, but once again the Sandites rose to the occasion and tied it with singles from Sartin and Cal Watkins. Brycen Peterman ran courtesy for Sartin, and both runners scored on a pair of passed balls. The Sandite luck ran out from there. Brooks Fowler hit an RBI single in the fourth, Dylan Hammond hit a double and scored on a fly out in the fifth, then Geo Blackshaw hit an RBI single in the sixth. Berg was credited with the loss, throwing four hits, three strikeouts, and two walks in four innings. Michael Miller closed out the night, pitching six hits and two walks in three innings. Sand Springs will return to action Friday night against the Bixby Spartans (19-5). The Oklahoma Coaches Association released its list of All-State basketball honorees recently and Sand Springs had several recipients. The organization only recognizes seniors. Destiny Johnson and Holly Kersgieter both made the All-State Girls team, while Cole Durkee and Cale Savage received Class 6A All-Star status. The All-Star honor recognizes top-players from each classification, while the All-State team is the absolute cream of the crop. Johnson, a University of Tulsa-commit, was also named to the Oklahoma Girls Basketball Coaches Association All-State Team, and the Frontier Valley All-Conference First Team, and was named the FVC Defensive Player of the Year. Johnson shot 48.3% in the field and 75.9% on free throws this season, averaging 16.6 points, 3.7 rebounds, 1.3 assists, and 2.8 steals per game. She scored 1,315 points in her career. Kersgieter, a University of Kansas-commit, was also named to the OGBCA All-State Girls Team and FVC All-Conference First Team. Kersgieter shot 46.5% in the field and 76.1% at the charity stripe, averaging 19.2 points, 9.2 rebounds, 1.3 assists, and 2.0 steals per game. She finished her career with 1,406 points. Savage, a Northern Oklahoma College Baseball-commit, also made the FVC Third Team. Savage shot 45.7% in the field and 78.5% at the stripe, averaging 12.0 points, 3.3 rebounds and 1.0 assist per game. He totaled 650 points in his career. Durkee shot 43.7% in the field and 66.7% at the stripe, averaging 4.1 rebounds and 8.7 points per game. He scored 484 points in his career. The girls will play in the OCA All-State game July 24th at the Oral Roberts University Mabee Center at 8:30 p.m. They will also play in the OGBCA All-State game June 1st at 1:00 p.m. at Norman North High School. The Charles Page High School varsity baseball team (16-3, 5-1) picked up a pair of district wins against Ponca City (7-15, 1-5) in a home-and-home series Monday and Tuesday. On Monday they needed an extra inning to edge out a 2-1 victory over Ponca. The Wildcats scored their only run in the bottom of the second thanks to an error at second and an RBI triple. Cal Watkins quickly tied the game in the top of the third, bringing in Seth Villines on a single. Cale Savage hit a double in the eighth to score Kiefer Massey for the win. Sand Springs out hit the Wildcats four to one and both teams picked up six walks each. The Sandites stranded six runners and Ponca left seven on base. Undefeated senior Ben Banker (5-0, 6-0) got the start on the mound, walking three and giving up one hit in three and one third innings. John Miller (2-0, 7-1) took over midway through the fourth and was credited with the win after walking three and striking out seven. 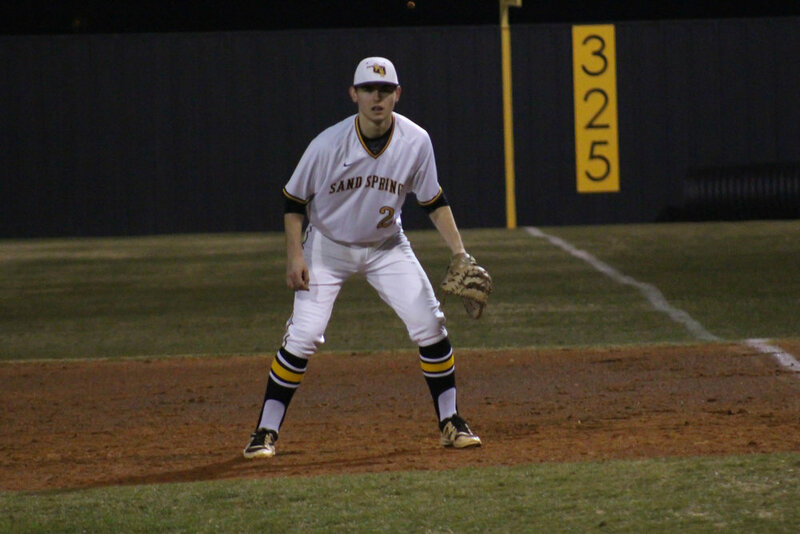 Tuesday’s game was a totally different story as the Sandites scored four in the first inning and led 7-0 before the Wildcats tried to rally with four runs in the final two innings. Tyler Ash, Watkins, and Savage hit singles in the first inning, with Savage scoring Ash. Watkins scored on a fielder’s choice and Ethan Sartin hit a double to bring in Savage and Jacob Snodgrass. Watkins and Savage scored on a pair of errors in the bottom of the fifth, and Malachi Burks stole home. The Wildcats finally got on the board with an error in the sixth. Austin Haney hit a solo homer in the seventh and Ponca loaded the bases with a single and a pair of walks. Eli Wohl scored two on a double and the Wildcats reloaded with another walk, but a Watkins strikeout secured the win. Sebastian Cassity (3-1) got the start and win on the mound, throwing four hits, three strikeouts, and two walks in six innings. Watkins (1-0) closed out the night and was credited with his second save of the season, throwing a hit, a strikeout, and two walks. The Charles Page High School girls’ soccer team (6-5, 1-3) traveled to Shawnee Tuesday night riding a four-game losing streak, but snapped out of it with their first district victory of the season, putting them back at a winning overall record. The Lady Wolves (3-6, 1-3) were coming off a 2-0 win over Capitol Hill (3-6, 0-3) that broke a three-game losing streak. 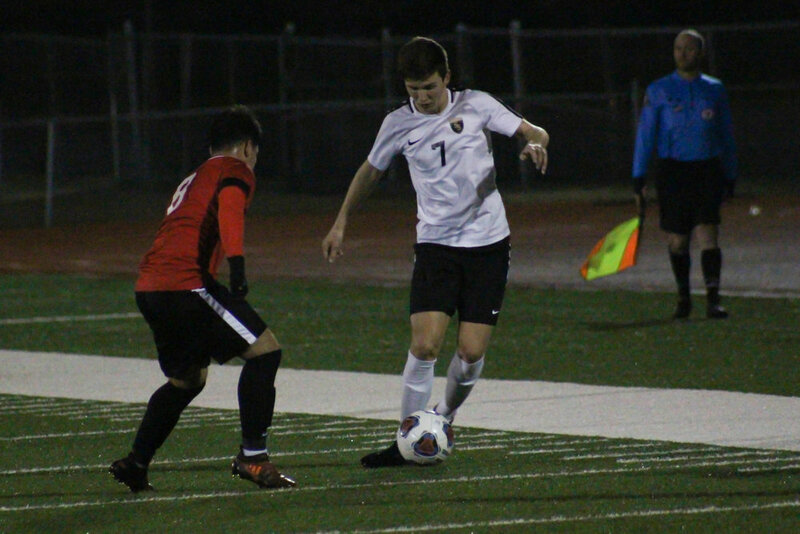 They fell 1-0 in an overtime shootout, but held Sand Springs to 100 minutes of scoreless action. The Sandites started the season averaging 3.5 goals per match, but haven’t scored one since a 6-0 shutout of East Central (2-10) nearly a month ago. Shawnee got a corner kick early in the first overtime period but sent it wide and Sand Springs quickly flipped the field. Arial Esparza got off two shots in the first overtime and sent one just barely over the goal. Sophomore Sandite goalie Ali Day made a save in the 87th minute. Braunya Lewis saved a beautiful corner kick from Josie Gelsthorpe in the second overtime, then Alyssa Perry had a nearly perfect shot that just barely caught the top of the goal and spat back out. Finally, the match went into a PK shootout tiebreaker. Day saved a shot from Hope Young on the first kick, and the Wolves never caught back up. Hailey Saterfield, Sidney Waddell, and Amanda Harris made kicks for Shawnee, while Demi Deshazo, Perry, Esparza, and Kaslynn Horton scored for the Sandites. Trailing 4-3, it came down to Lillian Davis to keep the match alive, and Day made another save to secure the game. The victory keeps the girls’ playoff hopes alive, but they’ll need to win at least two of their last three matches. They will host their last home game Friday at 6:00 p.m. against Union (2-5, 1-3) and will play Owasso (11-1, 4-0) and Capitol Hill (3-6, 0-3) next week. Sophomore standout Fernando Saldana scored a career-high three goals and one penalty kick Tuesday night, leading the Charles Page High School soccer team (10-1, 3-1) to a 4-1 victory against Shawnee (8-4, 0-4). Saldana recorded his first hat trick of the season with a penalty kick four minutes into the second half, and scored his third goal in the the 52nd minute. He had to sit out the prior game after earning three yellow cards in nine matches, and the scoring he missed out on against Norman clearly rolled over. Shawnee started hot but quickly ran out of momentum. Kossi Kodoe had a shot on goal less than a minute in that spat off the post, and Ethan Tippit saved the corresponding corner kick. Kodoe wouldn’t be stymied for long, however, and netted the Wolves’ first and only goal in the 12th minute of regulation. Jack Bratcher was aggressive early on, nearly scoring a header on a corner kick that barely cleared the top of the goal. He sent a pair of shots a hair wide in the 7th and 15th minutes. Gustavo Saldana had a shot saved in the 21st minute, Gustavo Franco sent one wide in the 24th, and Luke Jeffus bounced one off the post in the 26th before the team finally hit pay dirt. With twelve minutes left in the half, Bratcher had one rejected off the post but Fernando Saldana sent it back on a diving header to tie the match. Franco, Bratcher, and Fernando Saldana continued to bring the heat in the final moments of the first half. Saldana had a shot hit the top of the post, deflect into the ground inside the goal, then spit back out, and Sebastian Rodriguez saved two Bratcher attempts in the final three minutes. Finally, Saldana notched the go-ahead goal on a deflection with under a minute left. The Sandites were the aggressors through most of the night and had eight corner kicks to Shawnee’s three. Rodriguez saved multiple shots from Jeffus and Bratcher in the second half, and Miquel Sanchez also had a shot travel a hair wide. Sand Springs Soccer will host its final home match of the regular season Friday at 8:00 p.m. against nationally-ranked No. 12 Union (6-1, 4-0), currently the top team in the district. They also have road matches against Owasso (7-5, 3-1) and Capitol Hill (5-6, 2-2) next week before Playoff assignments are released. The Charles Page High School track and field teams failed to crown a champion for the first time this season, but had two runners-up and 26 personal-best finishes at the Reasor’s Track Classic in Tahlequah Friday. Aden Baughman settled for second in the 800-meter run for the first time this season, despite having his best performance of the year. He finished in 1:53.83, his best mark since the 2017 Meet of Champions, and was only 0.03 behind 5A State Champion Jack Vincent. Joel Mackey earned his first silver medal of the season the 100-meter dash with a time of 11.15 and also took third in the 200 in 22.21. Jaelyn Jackson took third in the 400 with a PR 51.28 and Jacob Smith placed fourth in the 3200 in 10:26.63. Matt Wilkerson crushed his previous personal record in the 100 hurdles. He finished the 110 in 17.93 to earn his first team points in sixth place. Two Sandites earned points in discus, each with personal records. Mitchell Medford threw 149’07 for third place and Riley Magee threw 137’06 for fifth. Mackenzie Rader tied her personal record in the high jump, clearing 4’08” for fourth place. The boys placed seventh in a field of fourteen and the girls finished twelfth out of fifteen. Owasso won the meet by significant margins in both the boys’ and girls’ competitions. The Sand Springs teams will return to action Friday at 10:00 a.m. in the Yukon Classic. 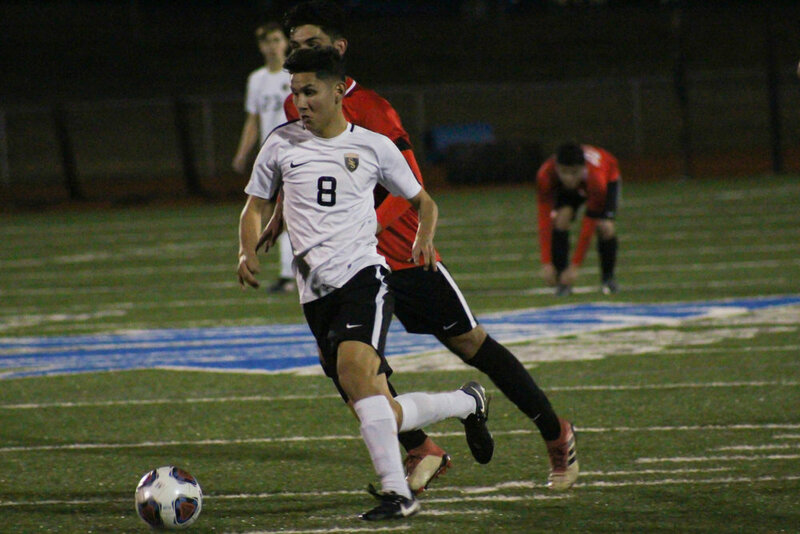 The Charles Page High School boys’ soccer team (9-1, 2-1) suffered their first loss of the season Friday night in an overtime shootout against Norman (7-2, 1-2). The Sandites kicked off a ten-match win streak in the 2018 season finale and were undefeated for the first five weeks of the 2019 season in what could very likely be a record-setting run for the program. It’s hard to say for certain that it hasn’t been done because historic records haven’t been properly kept in decades past. But since Sandite Pride News launched in 2014, their best record has been the 5-9 tally they reached in the past two consecutive seasons. Since then they haven’t won two district matches in a season till now. The team that finally beat them is 16th in the United Soccer Coaches national rankings. If the Sandites continue winning the way they have been, they could easily qualify for the State Tournament. Regardless of how the final three weeks shake out, this team has already left its mark as one of the most successful teams in program history. On Tuesday the boys notched their ninth win of the season in an overtime shootout against Edmond Santa Fe (4-7, 1-2). Jack Bratcher notched the lone goal in regulation, and neither team scored in the two overtime periods. In the shootout Luke Jeffus, Fernando Saldana, David Fancher, and Cameron Summerton made penalty kicks to secure the win. The team lost Saldana, their leading scorer, after he drew his third yellow card in nine games and was forced to sit out Friday. The match went scoreless till the 67th minute of regulation when Sandite goalkeeper Ethan Tippit fouled Leyton Lawter and the Tigers were awarded a penalty kick. Jackson Kim put the visitors on the board and things looked bleak for the home team. Kaleb Brooks came up clutch for the Sandites, netting his first goal of the season with only three minutes remaining. A yellow card was issued to a Norman player after Bratcher was fouled with six seconds left to play and Kaiden Cox took a free kick, but time ran out and the boys went to overtime for the second time this week. Following two scoreless overtime periods and a hundred minutes of game time, the match came down to a penalty kick shootout. Sophomore Xander Quiroga took over at goalie for Sand Springs and University of North Carolina Asheville-commit Nate Holladay played defense for the Tigers. Jeffus and Grady Wade made the first kick for each team, but Gustavo Saldana caught the top post on the second kick and Griffin Storm gave the Tigers the lead. Fancher got the Sandites back on track, Jackson Kim retaliated, then Summerton and Ted Foster missed wide. Trailing 3-2, it came down to Bratcher. The standout sophomore was right on target, but Holladay made the save to knock off one of only two undefeated teams remaining in Class 6A. The only remaining undefeated is nationally-ranked No. 5 Jenks (7-0). The Lady Sandites (5-6, 0-3) suffered their fourth-straight shutout loss and are still looking for their first district win. Since defeating East Central 6-0 in mid-March, the girls have fallen 0-2 to Enid, 0-7 to Sapulpa, 0-2 to Edmond Santa Fe, and 0-4 to Norman. Sophomore forward Brooke Goodman scored the first two goals for Norman, putting the Tigers on the board in the 11th minute and notching a brace just 80 seconds later. Aly Burkhart made a penalty kick six minutes into the second half and Megan Jones scored a header in the 67th minute. Despite the loss, sophomore goalie Ali Day was exception with numerous saves against the potent Tiger offense. Sand Springs Soccer will return to action Tuesday with a district trip to Shawnee. Norman will travel to Edmond Santa Fe on Tuesday. Girls will play at 6:00 p.m. followed by boys at 8:00 p.m. The Class 6A No. 14 ranked Charles Page High School slow pitch softball team (9-0) continued their undefeated start to the season Friday night, dominating No. 15 Jenks (8-11) in the Haskell Tournament finals. The Lady Sandites outhit their foes 14 to 5 in an 11-1 four-inning run-rule victory. Sabrina Usher kicked off the night with a solo home run in the bottom of the first, but the Sandites really put it away in the second inning. Three singles loaded the bases and the Trojans gave up runs on a walk and a single from Aliyah Taff. Raegan Rector hit a three-run triple to clear the bases, then came in on a triple from Felicity Horn. Horn scored on a line out by Usher and Mackenzie Bechtold hit a RBI single for a 9-0 advantage. The Trojans finally got on the board in the top of the fourth thanks to a triple from Jaycee Watson, who tagged up on a line out. Usher singled in Rector in the bottom of the fourth, Luttrell singled to load the bases, and Horn walked in to secure the ten-run margin and the win. Luttrell got her sixth win on the mound this season, throwing five hits and no walks. Sand Springs softball will return to action Monday at 1:30 p.m. when they rematch the Trojans in the first round of the Jenks Festival.